"If this story ain't true... it shoulda been!" Based on the life of an actual historical person called Judge Roy Bean, this western set in West Texas details the idiosyncrasies of an eccentric local Justice of the Peace who lived during the Victorian Era. Despite lacking any formal training, this early settler in his own quirky way sought to enforce law and order over his tiny community. He sometimes dispensed rough justice, or at least, a very arbitrary version of the law. 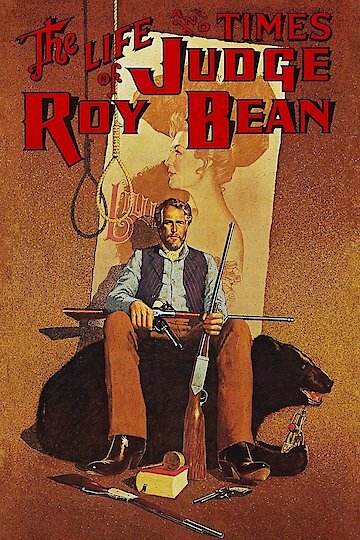 The plot unfolds as Judge Roy Bean pursues his chosen profession while honoring Lily Langtree, a singer who personified the Judge's vision of an ideal woman. The Life and Times of Judge Roy Bean is currently available to watch and stream, buy, rent on demand at Vudu, Amazon, FandangoNow online.